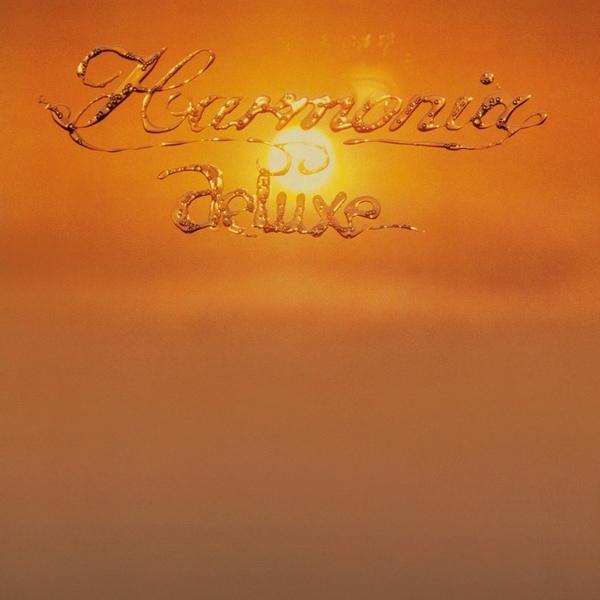 In June 1975, the three members of Harmonia returned to their studio in Forst for the recording of their sophomore album, Deluxe which was rereleased by Grönland Records on 18th December 2015. Deluxe would become the followup to Musik Von Harmania, which had been released in January 1974. Sadly, this groundbreaking album had failed to find an audience. It was a bitter blow for Harmonia. Following Brain Records’ release of Musik Von Harmania in January 1974, Harmonia headed out on a promotional tour. In these pre-internet days, this was the only way a band had of promoting their album. Harmonia could’ve picked a better time for a tour. The tour took place was the middle of a long, cold German winter. Early 1974 was especially cold. Harmonia travelled wrapped in layers of clothes. Their gruelling schedule saw them criss cross Germany. Some nights they played towns, other nights, some of West Germany’s biggest cities. Among the audience were fans of Neu! and Cluster. They were joined by the few people who had bought Musik Von Harmonia. Those that made their way to each venue, heard this nascent supergroup at their inventive best. This included on the 23rd March 1974, at Penny Station in Griessem, Germany. That night, Harmonia’s concert at Penny Station in Griessem was to be recorded, and would be released as a live album. Buoyed by the thought of recording their debut live album, Harmonia gave one of their finest performances of their winter tour. From the moment Harmonia took to the stage, they were at their innovative, genre-melting best. Those that heard Harmonia that night, thought that the resultant live album would be the perfect showcase for the nascent supergroup. It should’ve been. Sadly, the resultant live album, Live 1974 would only be released on 18th September 2007. By then, the Harmonia story had taken several few twists and turns. Once Harmonia’s tour was over, Hans-Joachim Roedelius and Dieter Moebius began work on the next Cluster album. Meanwhile, Michael Rother and Klaus Dinger owed Brain Records an album. Then Neu! would have fulfilled their contractual obligations. For the recording of what became Neu!! ’75, Michael Rother and Klaus Dinger reunited in December 1974 at Conny Plank’s studio. By then, Conny’s Studio was the go-to recording studio for German groups. They all wanted “the genius” to sprinkle his magic on their albums. This would be the case for Neu! ’75. Just like Neu! 2, Neu! ’75 didn’t sell well. The problem was, many people didn’t understand what was essentially parts of two disparate albums joined together. The proto-punk of side two was so different from the ambient sound of side one. Records buyers were confused, and didn’t understand what Neu! stood for? It seemed that Neu! were just the latest groundbreaking group whose music was misunderstood and overlooked. Michael looking back at Neu! ’75 reflects: “It was a time time. Klaus wasn’t the easiest person to work with. He was involved with different people, and being pulled in different ways. We were also very different musically. Then there were the new drummers on side two. They weren’t particularly good. Certainly neither were as good as Klaus,” a rueful Michael remembers. “It was a difficult project. By then Klaus was different to the man I’d met a few years earlier.” Michael wouldn’t work with Klaus for another decade. By then, Michael would’ve embarked upon a solo career. That was still to come. Before that, Michael would record what became Harmonia’s sophomore album, Deluxe. With Neu! having fulfilled their contractual obligations, Michael Rother was free to record Harmonia’s sophomore album, Deluxe. So Hans-Joachim Roedelius and Dieter Moebius took time out from Cluster. Now, they could begin work on the followup to Musik Von Harmonia, Deluxe. Joining the three members of Harmonia, was a new face, Conny Plank, who was co-producing Deluxe. Conny Plank and Michael were good friends, and had worked together on three projects. This included Kraftwerk’s aborted album and Neu!’s two album. The addition of the man who Michael Rother calls: “the genius,” just happened to coincide with Harmonia changing direction musically. When Deluxe was released in 1975, it was to the same critical acclaim as Musik von Harmonia. The noticeable shift to what was a more commercial sound, surely would lead to a change in Harmonia’s fortunes? That wasn’t to be. Deluxe was released on 20th August 1975, and sales of the album were slow. They never picked up, and history it seemed, was repeating itself. Michael reflects: “Still our music was being ignored. It was a difficult time for us. So much so, that Michael decided to record his debut solo album. However, he left and the other members of Harmonia left behind a classic album, Deluxe. Straight away, Harmonia’s showcase their finely sculpted, and much more structured sound on Deluxe. Michael Rother had encouraged the other members of Harmonia to incorporate traditional song structures on the album. This he told them, would be easier to replicate live. However, two other changes played an important part in Deluxe’s sound and eventually, success. The two other changes Michael Rother made, were to bring onboard Conny Plank to co-produce Deluxe; and Guru Guru drummer Mani Neumeie to play on some tracks. Deluxe was going to be a very different album, and the new Harmonia make their presence felt from the get-g0. A futuristic synth signals the arrival of the synths and keyboards on album opener Deluxe (Immer Weiter). Washes and stabs of meandering, lazy synths join dreamy keyboards. Sometimes the synths have a futuristic, otherworldly sound. Other times, they just shimmer, and melt blissfully into the ether. Meanwhile, understated drums underpin the arrangement. Later, melodic, ruminative vocals are shrouded in effects. This results in a noticeable Kraftwerk influence. One wonders if this is down to Michael, a former alumni of Kraftwerk? For his part, Michael unleashes bursts of jagged, rocky guitar. Occasionally, his guitar produces an elegiac wash of lysergic, melodic and mysterious music. Soon, the arrangement veers between ethereal, cinematic, mesmeric, occasionally dramatic and sometimes, futuristic and otherworldly. This is down to the sci-fi synths and carefully hewn keyboards. That’s not forgetting the slow, pulsating heartbeat. It adds an element of drama, to the genre-melting arrangement. At its heart, are elements of ambient, avant-garde, Kominische and rock. They’re combined by Harmonia and Conny Plank, who create what’s Harmonia’s neu, groundbreaking sound. Synths sweep and beep on Gollum, before Guru Guru drummer Mani Neumeie almost caresses his drums. He eschews the power he unleashed on previous Guru Guru albums. Meanwhile, sci-fi synths shimmer and glisten. They range from Blade Runner-esque, to ethereal and elegiac. Sometimes, it’s as if Harmonia are providing the soundtrack to a sci-fi film. However, it’s left to the listener to provide the soundtrack as the arrangement glides effortlessly along. Gradually, the tension builds to this cinematic track. Mani’s drums rumble, while hypnotic keyboards add tension and drama. All the time, the otherworld synths flit in and out, as this timeless, cinematic track heads towards its dramatic crescendo. Kekse reminds me both of library music being produced in Britain and Europe in the early seventies, and Eastern European experimental music. The arrangement is like a mesmeric, merry-go-round, with sound effects interjecting. What sounds like animals and birds, gives way to lumbering seventies synths. Meanwhile, the mainstay of the arrangement has an obvious Kominische influence. Other parts of the arrangement, have been influenced by avant garde, classical and experimental music. Later, dreamy synths meander as the sound effects become more prominent. It’s like a journey into the Forst countryside, complete with the soundtrack of animals, birds and the tranquil sound of a river. Adding the final touch is a pastoral piano solo from Hans-Joachim Roedelius. Gradually though, its ethereal beauty dissipates, leaving a memory of Harmonia at their most ambitious and innovative. As Monza (Rauf Und Runter) unfolds, synths meander, flutter and stutter. Meanwhile, Michael Rother unleashes washes of his guitar. It reverberates into the distance. Deep down in the arrangement, sound effects bubble, and an guitar chirps. All this plays a part in what’s a dark, dramatic arrangement. Then it’s all change, when Mani is let off the leash. He powers the arrangement along, and Michael discovers his inner guitar hero. By then, a joyous, freewheeling fusion of Kominische, rock and proto-punk has unfolded. It’s Mani’s drums that underpin the arrangement, while searing, blistering guitars are unleashed. They’re augmented by bursts of vocals and keyboards. Mostly though, it’s Mani and Michael who drive the arrangement along. Rocky guitars, crashing cymbals and pounding drums join sci-fi synths as Harmonia are a group transformed, on what’s one of the highlights of Deluxe. Banks of progressive rock keyboards open Notre Dame. The keyboards almost sound as if they belong in a church. They’ve a big, bold and impressive sound. Some would say grandiose. That’s no bad thing. Soon, though, a drum machine provides a subtle, sonic heartbeat. Then after 1.22 it’s all change, as otherworldly synths become elegiac. A futuristic sound gradually emerges from the slow, pedestrian arrangement. Synths and keyboards play a leading role. Panning is used effectively, giving the arrangement a lysergic sound. Later, the progressive rock keyboards return for an encore, and race across the arrangement. The hypnotic drumbeats make no attempt to keep up, and provide a contrast to this captivating musical adventure. Walky Talky closes Deluxe, Harmonia’s 1975 sophomore album. A bass is joined by plink plonk keyboards, before what resembles a braying horn interjects. This however, comes courtesy of Harmonia’s trusty synths, and adds an element of drama. Mani, Guru Guru’s legendary drummer returns for the finale. So do the futuristic, sci-fi synths and washes of Michael’s guitar. It chirps, shimmers and glistens, producing an elegiacal sound. By then, a myriad of disparate sounds are flitting in and out of the arrangement. They range from subtle and ethereal, to bold and dramatic, right through to futuristic, haunting, mesmeric and even otherworldly. It’s fitting finale to Deluxe, and finds Harmonia at their very best. Sadly, in 1975, very few people heard this future Kominische classic. Gradually, though, Kominische muzik began to grow in popularity. By the nineties, and the internet age, a new generation of record buyers had discovered Kominische muzik. Harmonia were regarded as one of the Kings of Kominische muzik. So it was fortunate that the long lost master tapes for Tracks and Traces were discovered. Tracks and Traces was belatedly released in 1997. Over the next ten years, interest in Harmonia was at an all-time high. Gradually, though, Kominische muzik began to grow in popularity. By the nineties, and the internet age, a new generation of record buyers had discovered Kominische muzik. Harmonia were regarded as one of the Kings of Kominische muzik. So it was fortunate that the long lost master tapes for Tracks and Traces had been discovered. Tracks and Traces was belatedly released in 1997. Over the next ten years, interest in Harmonia increased. 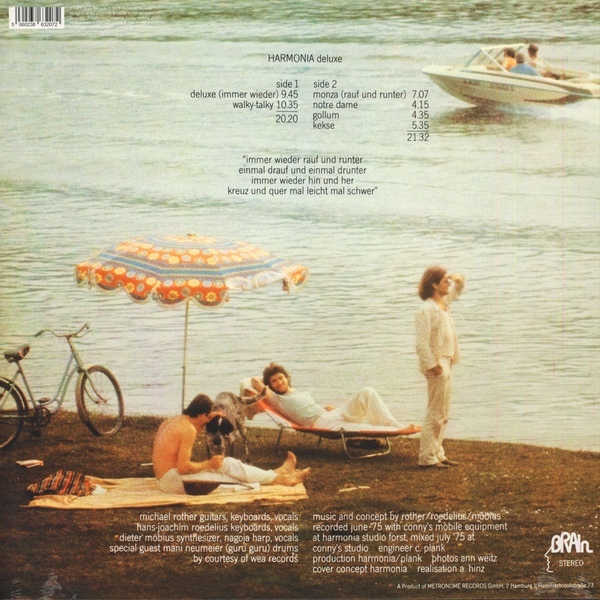 By 2007, Harmonia’s Live ’74 album was reissued. To promote the album, the three members of Harmonia reunited for what turned out to be their final concert. Never again would the three members of Harmonia take to the stage together. Dieter Moebius, Harmonia’s synth player died on 20th July 2015. He left behind a rich musical legacy, including what many critics regard as Harmonia’s finest hour, Deluxe. It was reissued by Grönland Records on 18th December 2015. The sound quality of the remaster is stunning, and sets the bar high for future remasters. Grönland Records’ remaster of Deluxe is the definitive reissue, and is the best way to discover or rediscover this timeless Kominische classic. 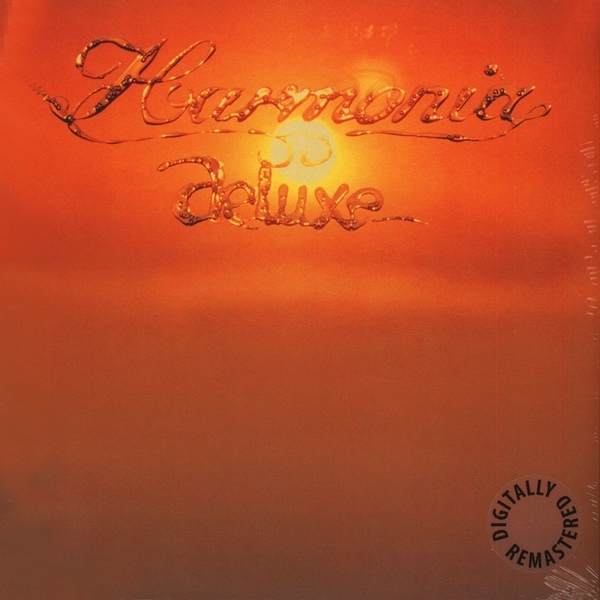 On Deluxe, Harmonia changed direction musically. Michael Rother encouraged the other members of Harmonia to incorporate traditional song structures on the album. This he told them, would be easier to replicate live. The result was a finely sculpted and structure album, where Harmonia combine disparate genres. Elements of ambient, avant garde, experimental and progressive rock can be heard on Deluxe. So can psychedelia and classic rock. However, Deluxe has a much more prominent Kominische influence than Musik Von Harmonia. Partly, this comes courtesy of Guru Guru’s legendary drummer Mani Neumeier. He played on three tracks on Deluxe, and his drums add a Kominische influence. Another change was that Michael Rother’s guitar played a more prominent role. It steps out of the shadows of the keyboards and synths, and helps transforms Harmonia’s sound. The other change from Musik Von Harmonia, was the addition of Conny Plank, who co-produced Deluxe. By then, Conny Plank was a vastly experienced producer. He had worked with Michael Rother on Kraftwerk’s aborted album, and then on Neu!’s first three albums. The two men had established a good working relationship, and Conny Plank was the perfect man to help sculpt and structure Harmonia’s new sound on Deluxe. It was a remarkable transformation. One can’t help but wonder what Harmonia’s next album would’ve sounded like? Although Harmonia went on to collaborate with Brian Eno on Tracks and Traces, Deluxe was their swan-song. Harmonia as a band was quietly dissolved, and what become one of the most innovative, inventive and influential Kominische bands were no more. Hans-Joachim Roedelius and Dieter Moebius continued to work together as Cluster. Michael Rother embarked upon a career as a solo artist. It was only much later that Harmonia’s two studio albums, Musik Von Harmonia and Deluxe, enjoyed the critical acclaim and commercial success their music so richly deserved. For Harmonia, it was a case of better late than never. Now somewhat belatedly, Harmonia are regarded as Kominische royalty, and Musik Von Harmonia and Deluxe, are part of a huge treasure trove of Kominische muzik awaiting discovery.